Improve communication with your team at the Microsoft Store with this deal on the Kingston HyperX CloudX Stinger Core Gaming Headset. You can now get it for $39.99 whereas before it was $52.99. That's 25% off the original price! 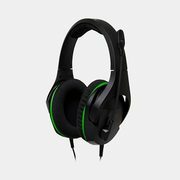 This headset boasts over-ear foam cushioning and a padded, adjustable headband, a wired connection, on-cable volume management, an adjustable mic that reduces background noise, and comes in a sleek black/blue design.